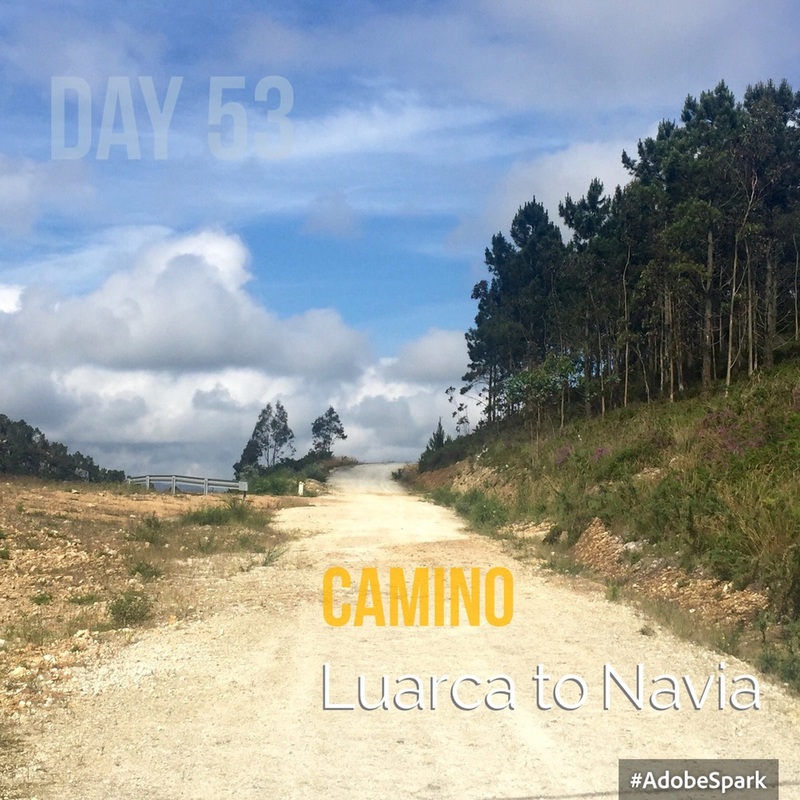 The climb up out of Luarca was pretty demanding but with good views down over the bay and then onto fairly level tracks and roads. At one point I misunderstand the yellow arrows and start off in the wrong direction over a motorway bridge; as if from nowhere a troupe of cyclists arrive and put me back on the track right. Sometimes the arrows are placed facing the wrong direction, so they are only visible once you've gone past them. At another point I head up a hill and a lorry honks and then a car stops to tell me to turn round. I imagine that I'm fairly invisible as I trudge along, but watchful eyes are making sure I get to Santiago! I stop to photograph some fun metal animals outside a farmhouse at El Palacio. The old man comes out for a chat; when he finds out that I'm English he says something to the effect "Britain has left the EU but you're European!? He looks puzzled and I just sign 'crazy' and 'gun to head'. 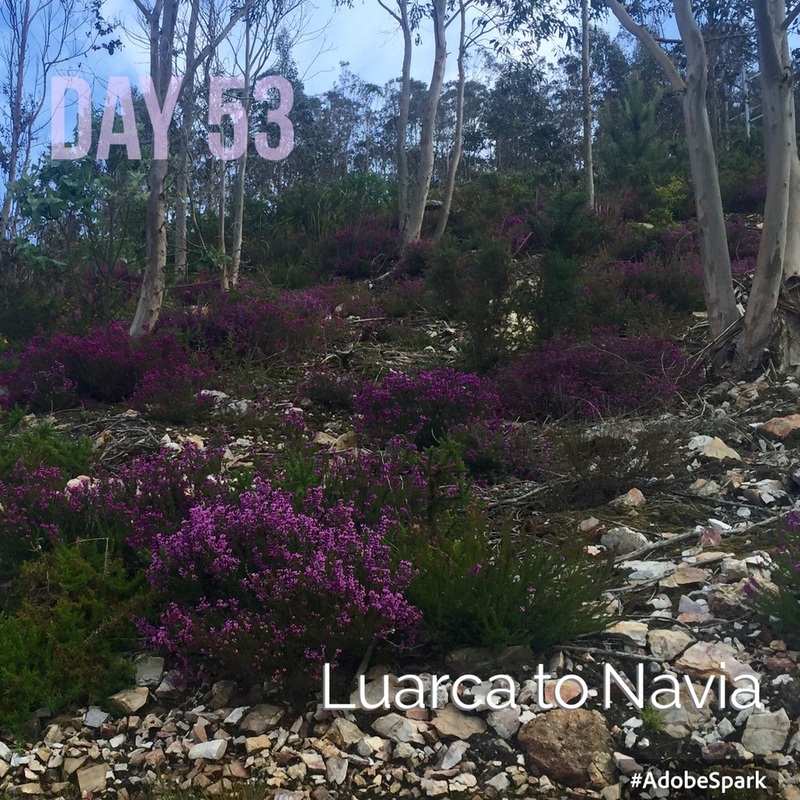 As I climb up through eucalyptus plantations the magenta heather is blooming amongst the bracken. A wide white track travels up to the horizon. Lovely. On the way I stop at a bar for water and a woman, who I initially thought was English walked in. It turned out later that she is Belgian and works for the Dutch organisation that looks after pilgrims in Santiago. She's walked seven pilgrimages and has her routine honed to the tee! We meet up again in town trying to find a pension and have a drink in the evening; then I bump into Paul a Swiss-German guy I had met in the road yesterday and we meet up for supper. Navia is an industrial port-town on the wide Rio Navia and although it has ancient origins there is little remaining. There are several large bridges, a timber processing plant billowing steam, some shipyards, a railway station and lots of bars. There is no albergue here, so I check into a pension- a single room with shower for €25. Not good value, but there was not much choice. But on the upside the water was hot and the restuarant downstairs served a nice Menu del Dia. Squid and chickpea stew followed by mixed salad and an apple and a whole bottle of red wine, which Paul and I share. It's Fiesta night in town - so I don't get much sleep. The music goes on until 3am and then I get bitten by something... I sincerely hope it's not a bed bug. I get up in the middle of the night and strip the bed and put on the bedbug sheet. Buen Camino!